This is the first site that shows up when I search for linen by the yard on Google. It's a U.S.-based online retailer mainly of all-linen fabrics and also linen-cotton blends, located in (or at least shipping out of) Commerce, CA. Prices are relatively low, lower than Jo-Ann's regular prices on 100-percent linen, for instance. Shipping rates aren't flat, but "determined by the weight and location of the order." My order, which cost $188.37, should have totaled about 7 pounds 10 ounces/3.46kg, and shipped to southeastern Pennsylvania, was charged $28.63 in shipping and handling. The new fabrics, even the "softened" ones, have a smooth, slightly stiff finish, which reverts to the familiar fluffy and wrinkly appearance after washing and tumble drying. I haven't yet measured it for shrinkage. The 5.3-ounce medium weight is indeed heavy enough for a tunic. The 7.1-ounce heavyweight is just about heavy enough for trousers, but both are definitely summerweight if worn unlayered. Unfortunately, to judge from reviews and customer photos, the site's own swatches don't accurately represent the fabrics' colors. Thus, trying to choose colors that approximate those produced by historical dyes is an uncertain endeavor. I've tried to correct the colors in my own photograph, but take them with a grain of salt anyway. 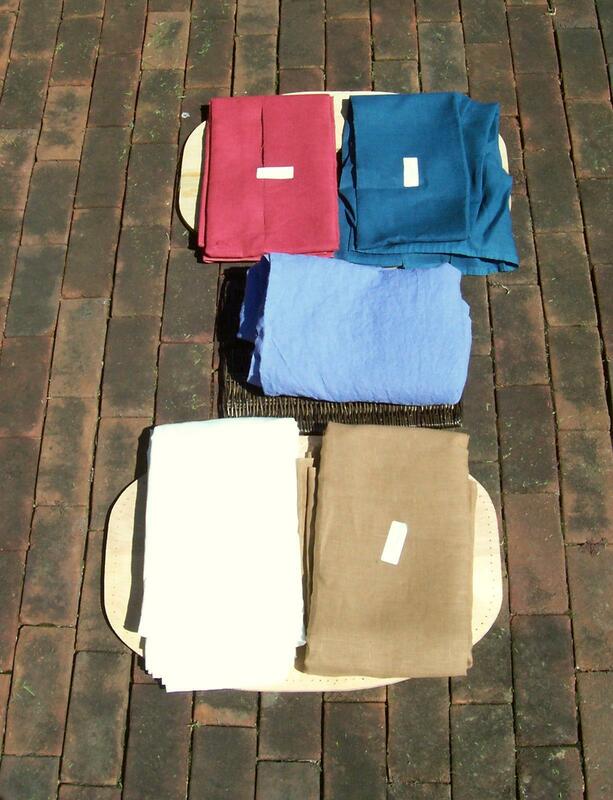 Redwood, top left, is close in appearance to linen dyed with a high concentration of madder (compare the 12.5-25 percent weight-of-fabric tests here). I'd hoped that Blue Bonnet, top right, would resemble indigo, but it's actually more greenish than it appears here. Perhaps one of the other medium blues would be better. Wisteria, center, is very slightly violet. I still think it's close enough to woad that I wouldn't complain about it. Again, perhaps another light blue would be better. Compared to distillatio's tests of lye water and sun-bleaching, Fabric-Store's Bleached is quite a bit lighter, being a pale ivory. It may be that continuous washing and sun-drying could lighten linen still further, but until I see more evidence, I suspect that the Pebble color might be a better choice for a commoner's moderately bleached linen. Ginger, bottom left, appears to be well within the ranges of walnut hull dye that I've seen images of. I didn't get a photograph of the natural (it was in the dryer at the time), but since it is just natural, unbleached linen, that shouldn't matter. Suffice to say it's the familiar dark greyish beige color, and not as yellow as it appears in the site photos.